O&K Print Watch lets you specify a different cost of printing for each printer and for each paper size. To access cost settings, select and right-click a printer in the tree on the left side, and select Properties → Cost in the context menu. The total cost of document printed will be calculated based on the page cost specified via the Base page cost field. If a printer supports color or two-side printing, you can specify the respective cost increase/decrease factors for Monochrome or Duplex printing. Different paper sizes are combined in Groups. For each group, you can specify a cost increase/decrease factor. There are a few inherent paper groups: LARGE, VERY LARGE, and EXTRA LARGE. Suppose, you have a color printer that supports color and duplex printing, with the paper sizes A2, A3, or A4. Set the base page cost at $0.50. That’s for A4. Set the discount for monochrome printing at 40 percent. Set the cost increase factor for the “LARGE” group at 30 percent. That’s for A3. Set the cost increase factor for the “VERY LARGE” group at 50 percent. That’s for A2. Set the discount for duplex printing at 50 percent. Use the Add, Edit, and Remove buttons to manage groups. Use the Paper size button to view and manage paper size groups. 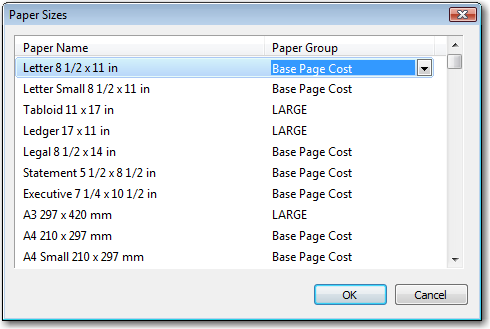 A paper size may have a Base cost per page, or belong to a group. You can include any paper size in any group. IMPORTANT: Paper size names and groups are common for all printers. 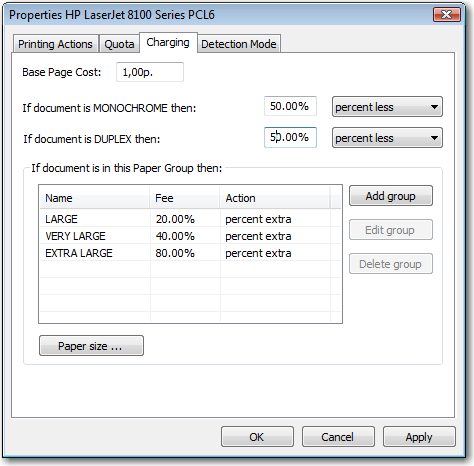 Base page cost, printing mode discounts, and paper group discounts can be specific for each printer.